Now tell me how justice will prevail when the accuser appoints a judge (one of his own) to sit over a case which he is part. Tell me how justice will triumph in a country where the president has indirectly warned the judiciary not release the accused who is on trial. Briefly explain to me how justice will peacefully see the light of the day when the masked-corrupt government of Nigeria has hijacked the entire judiciary. Where on earth and where is it in the constitution that the law legally permit masquerade to secretly testify against someone who was publicly accused? It's obvious that the Nigeria government have nothing to hold on to prosecute Nnamdi Kanu that's why they are beating round the bush, manufacturing and employing non-existing laws and procedures into the judiciary. The fact is that you can't accuse someone publicly and seek to try him secretly. That's arrant nonsense, corruption and murder of justice. 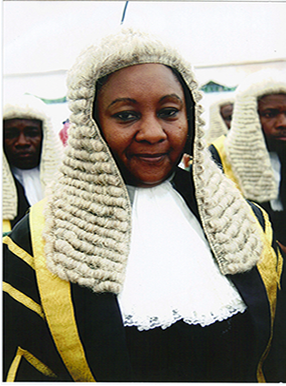 For Justice Binta Nyako(President Muhammadu Buhari's sister) to rule that masked witnesses testify against Nnamdi Kanu who was accused publicly, this shows how corrupt, manipulated, ethnical and politicized the Nigeria judiciary is. Any reasonable human being knows quite well that he who has facts and tangible evidence fears nothing in testifying openly for or against someone in the court of law. Justice Binta Nyako and the corrupt federal government of Nigeria led by Muhammadu Buhari think they can deceive and manipulate everybody through the Nigeria corrupt system of the judiciary no knowing that everybody are not fools. In other to execute and accomplish their evil plans, Binta Nyako backed up her ruling with a useless claim which she said she ruled that witnesses testify wearing mask and secretly in other to ensure their safety and protect their interest. And I ask, is that not arrant nonsense? Who have ever come out to say the Indigenous People Of Biafra harassed, threatened or murdered any of his own or family member because he or she indicted or did anything to them? Personally, what Justice Binta Nyako ruled on the 13th of December 2016 on regards to masked witnesses/secret trial is totally unacceptable because it is injustice. And let this be known to the world that all these injustice and delay of freedom for Nnamdi Kanu is a provocation for war which may eventually explode because when you dominate the people with violence and injustice, they'll definitely fight back. Nnamdi Kanu was accused publicly and should be tried openly with evidence.